You can buy Comodo Positive SSL certificaate from hostgator itself for $40/ yr or $95.98 /3 yrs . You can also buy 3rd party ssl certificate and get the SSL certificate installed by Hostgator for $10. The below process is for 3rd party SSL certificate installation. 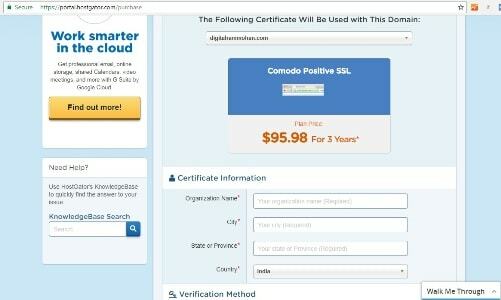 I have bought Comodo PostiveSSL certificate from www.Gogetssl.com ( https://www.gogetssl.com/comodo-ssl/comodo-positivessl/) for $13.85 /3 yrs. For buying SSl certificate you first need CSR key (Certificate Signing Request) generated from web host i.e hostgator. Please note that the address and organization information needs to match your WHOIS information for the domain for which you would like the SSL installed on. Save CSR and RSA Keys as text files in your computer, as you will need them both. While buying certificate you have verify that domain belongs to you or you are authorised to do so using DNS Cname / HTTP / Email option. This is possible because of SNI ( Server Name Indication) . SNI allows to run multiple SSL/TLS certificates on the same IP address. Request Hostgator for SSL installation here ( https://www.hostgator.com/installssl). Fill the Install SSL form with your cpanel id and password , SSL certificate(as text ) and CA bundle file ( both the intermediate CA certificates as text). You can select “Already have dedicated IP ” option in the form. Submitting form will create a ticket in your hostgator billing portal. Pay hostgator $10 for SSL installation using credit card. After SSl certificate is installed , we have to check SSL, if it’s installed properly without errors. Once SSL test is passed, you can start the process of redirecting HTTP to HTTPS, which I will write in my next blog post.